One monthly price. Auto renewed. 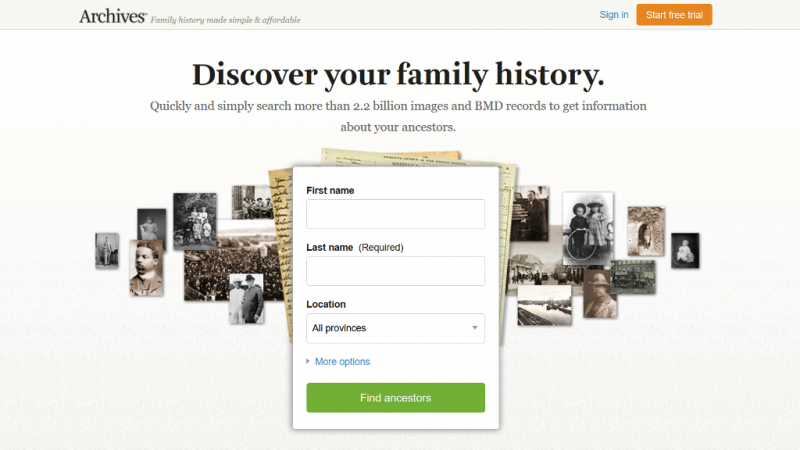 Tracing family history shouldn’t be too difficult or too expensive. Fortunately, Archives.com offers simple and affordable genealogy resources. Where people used to have to travel to libraries across the country and dig through microfiche to learn about their ancestors, online resources have made family history information quickly and easily accessible—which is great news, whether you’re a hobbyist or an advanced genealogist. There are records available in the United States and in the United Kingdom. 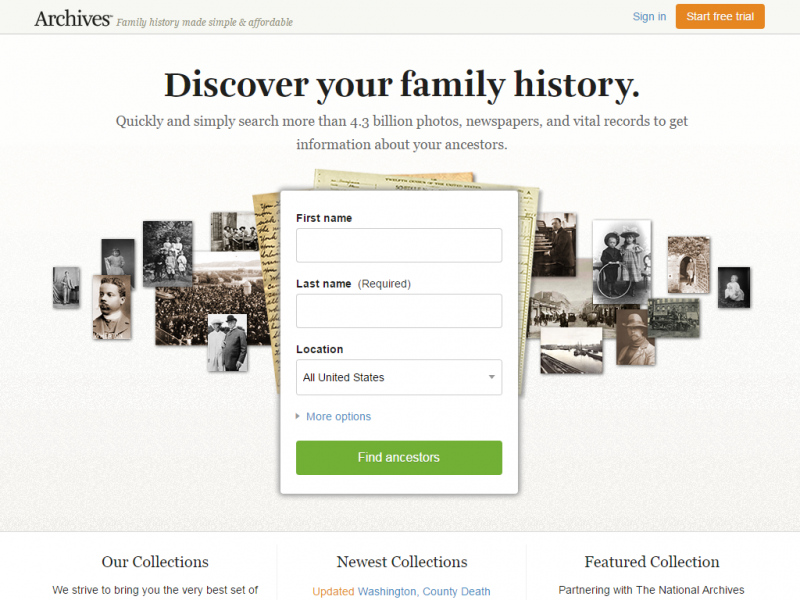 It’s also one of the most affordable family history sites, which is helpful if you’re just getting started. The community features of Archives.com are extremely helpful, especially if you’re new to genealogy. You can stay up to date on new features as well as tips and how-tos through the blog, Facebook and Twitter accounts. The company also features an “Expert Series,” where they bring in a research expert every two weeks to write an article that has lessons and tips, such as how to find local resources in your state, or basic genealogy forms you need to get started. There’s even an option to set up “ancestor alerts,” which notify you by email every time a record matches one of your searches. Overall, this is a well-designed site with access to an abundance of records. Archives.com offers a straightforward and easy-to-use interface. While this site isn’t the biggest genealogy site on the internet, this company is partnered with very good genealogy databases. The site has 1.1 billion digital records and is adding approximately 50,000 new records to its collection everyday. Searching for information is, arguably, the most important aspect of genealogy research. It’s easy to quickly become overwhelmed with all the records, certificates and archives available online. When searching a particular name, for example, there may be hundreds of results that have nothing to do with your lineage. So, the search features on a site become increasingly important. Archives.com offers a fairly simple search engine, but you have the option to narrow your search by U.S. state, birth year, death year, or type of record. Another option for finding the information you’re looking for is to browse the collections. Collections are historical groups of data gathered for study, comparison, or exhibition. A single record, such as a marriage or death record, can often be found as part of a state or government collection. Collections may be organized by state, county or city, for example. The best search tool we found was the "Search all Records" form since as the name suggests it will search all Collections at once for information on your ancestors. On the basic form, first and last name, estimated birth year and a location is required. Unless your ancestor had a fairly unique name the search results returned will probably be large. To narrow these results down you can add one or more life events to the search that you may know about the person. Life events of the person includes their birth, death, marriage, etc. and require the year it happened along with the location. You may also add known family members to the search request to help narrow the search results. This includes the first and last name of their mother, father, children, spouse and siblings. The advanced search form goes into more details allowing you to specify ranges on names (i.e. Soundex and Phonetic matching) to adding a year range for events. Gender and race can also be specified along with a list of keywords. Costs listed in US dollars. 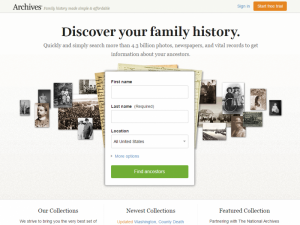 If you’re a beginner or an advanced genealogist, Archives.com is on of the most affordable and simple sites available. While you might think their low prices indicate a small collection of records, they actually have an impressive number of collections and records—so you will get your money’s worth by using this site. If you’re a more advanced researcher, at the affordable rate it can’t hurt to add more records collections to your searches. I have been using Archives.com for over 2 years now and have fully developed my family tree. I have traced my ancestors back over 150 years and have discovered through research some exciting lineages that our immediate family didn't know about. It has been an interesting experience going back in time and reading about my family here in North America and Europe. Archives.com is an excellent resource for those of us interested in genealogy. Large number of records from all sorts of resources. I found Archives has to few records to do proper research to create a family tree. I canceled my subscription over a month ago and they are still charging me. This is not right and has to stop. I plan to go to my bank tomorrow to prevent the company from charging them further. The site also has a lot of technical glitches. Pages consistently do not load and my browser becomes unresponsive. This does not happen to me on other websites. Archives is a RIP OFF! Canceled subscription but still having money taken from my account.